90 degree hdmi adapter avoid bending HDMI cables and relief the strain on HDMI ports to increase the lifespan of your device and HDMI cable. 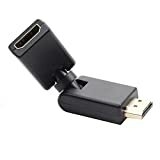 HDMI angle adapter's port will help ease the strain at the point of connection to eliminate damage to the HDMI ports on your devices. Gold plated interfaces resist corrosion and provide rigidity,Internal PCB board soldering,19-pin standard size connector,diaphragm fixed,quanlity more stable. Support resolutions up to 4Kx2K (UHD) including 1080P/1080I/720P/480P,support HD 3D video transmission,up to 10.2GBPS transmission rate. Environment PVC jacket,sturdy and durable,plug and play,angle adjustment at will,corner wiring is more convenient,extending HDMI cable to 15 meters.